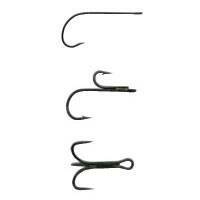 Tiemco's advanced method have revolutionized the design and manufacture of fly hooks. Tiemco has become the world-wide leader by introducing new hook styles that let flies look more life-like and by pioneering new manufacturing processes, such as chemical sharpening to improve hook performance. Each year we add new hook designs, extending the range of our hooks to meet the expanding needs of innovative fly tyers. 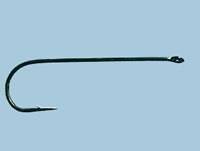 Each Tiemco hook style is designed specifically to satisfy the most demanding customers in the world: the fly tyers who depend on Tiemco hooks. Tiemco fly hooks are made with fly fishing in mind, and as a sharp, strong hook may be the single most important component in your fly fishing gear, we believe it makes perfect sense to choose some of the best hooks in the world. Think Tiemco! Aberdeen bend. Straight-eye. Standard wire. 3 x long. Black Japanned. Uses: Bass & Pike flies. During the past 75 years of commercial fly dressing Fulling Mill have tied well over a billion flies! They have looked at almost every fly hook that has ever been designed and have tested most of them, and they pride ourselves in always choosing exactly the right hook for the job! 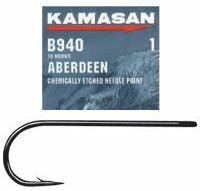 Benefit from our vast experience by using the hooks that they designed themselves to cover almost all our fly tying eventualities. 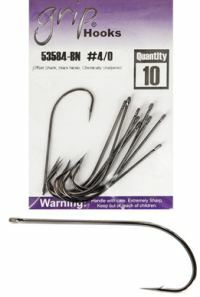 No gimmicks; these hooks are simply designed to make flies look great and catch more fish. Packaged in units of 50 per pack* offering exceptional value and convenience. Extra strong PVC packing/display wallets offer ease of storage and minimises storage space.